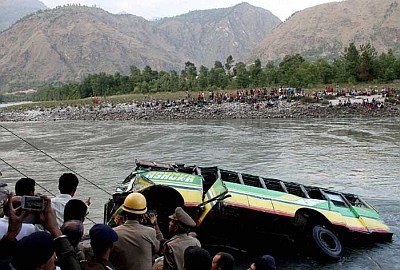 At least 25 persons were drowned and several others missing on Wednesday morning after a bus fell into the Gobind Sagar reservoir at Rayian near Bilaspur, 95-km from Shimla. Twenty-five bodies have so far been recovered while 15 injured persons have been taken to a Bilaspur hospital, Bilaspur Deputy Commissioner Ajay Sharma said, adding that efforts are on in full swing to trace the missing. The 40-seater bus was packed to capacity and some people were said to have been also travelling on its roof, sparking fears that the toll may be higher. number of students and labourers who were making their daily commute from Rishikesh to Bilaspur are among the victims. The bus has been pulled out of the reservoir. The ill- fated bus belonging to a private transportation company was on its way from Rishikesh to Bilaspur and most of the passengers on board were locals. Among the injured are about half-a-dozen passengers who managed to jump out of the bus in order to save themselves. Divers of Bhakra Beas Management Board have joined efforts to fish out the bodies. A large crowd of locals has gathered at the spot making anxious enquiries about the victims of the mishap.